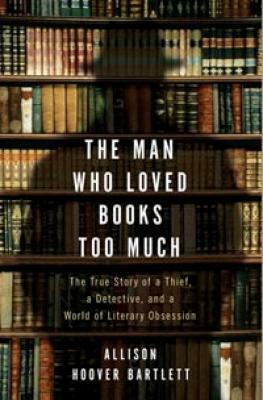 In the tradition of The Orchid Thief, a compelling narrative set within the strange and genteel world of rare-book collecting: the true story of an infamous book thief, his victims, and the man determined to catch him. Rare-book theft is even more widespread than fine-art theft. Most thieves, of course, steal for profit. John Charles Gilkey steals purely for the love of books. In an attempt to understand him better, journalist Allison Hoover Bartlett plunged herself into the world of book lust and discovered just how dangerous it can be. John Gilkey is an obsessed, unrepentant book thief who has stolen hundreds of thousands of dollars worth of rare books from book fairs, stores, and libraries around the country. Ken Sanders is the self-appointed "bibliodick" (book dealer with a penchant for detective work) driven to catch him. Bartlett befriended both outlandish characters and found herself caught in the middle of efforts to recover hidden treasure. With a mixture of suspense, insight, and humor, she has woven this entertaining cat-and-mouse chase into a narrative that not only reveals exactly how Gilkey pulled off his dirtiest crimes, where he stashed the loot, and how Sanders ultimately caught him but also explores the romance of books, the lure to collect them, and the temptation to steal them. Immersing the reader in a rich, wide world of literary obsession, Bartlett looks at the history of book passion, collection, and theft through the ages, to examine the craving that makes some people willing to stop at nothing to possess the books they love. Allison Hoover Bartlett's writing has appeared in the New York Times, the Washington Post, the San Francisco Chronicle Magazine, and other publications. Her original article on John Gilkey was included in The Best American Crime Reporting 2007.